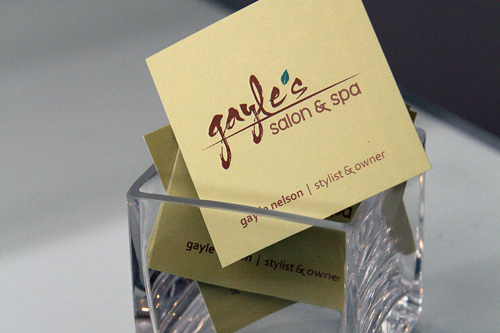 Manicure services at Gayle’s Salon & Spa feature signature hand therapies, including massage and scrubs, which soothe both your hands and your soul. Choose from traditional or Shellac polish, or collaborate with our stylists to create a custom nail art look.Our pedicure niche was designed with serenity in mind. Let our copper basin pedicure bowls and leather chairs embrace you as your tired feet are exfoliated, hydrated and massaged. Relax and enjoy the woodland view through your own personal picture window. Whether your skin needs a splash of hydration or improvement in texture and tone, you are sure to love the results and therapeutic benefits of our spa facials. The skincare professionals at Gayle’s perform skin cleansing and age-defying treatments that will leave your skin vibrant and healthy. Our make-up and lash extension applications are sure to compliment your look. We use 100% natural-mineral Mirabella cosmetics. We also airbrush foundation for a flawless, natural looking complexion. Have longer, fuller lashes with eyelash extensions from Xtreme Lashes. Flirty eys-lashes, the perfect accessory! Relax and rejuvenate with a tension eliminating massage or invigorating body treatment. Our massage therapists are experienced with everything from Swedish to hot stone; we have the massage to make your stress a thing of the past.Body treatments, like salt scrubs and body wraps, envelop your body providing a head to toe experience that gives your skin a luminous glow. A custom hair removal session, using sensitive skin sugaring or traditional waxing will get you vacation and swimsuit ready in a secure, professional environment. From perfectly arched brows to fuzz-free legs or a trip to Brazil, we can make unwanted hair a distant memory. Before taking your first step down the aisle, start with us for all your salon & spa services. Gayle herself will act as your Salon Bridal Consultant to ensure you feel confident in your personalized bridal look. You’ll be beautiful.Work with our certified Mirabella bridal make-up artists and talented hair stylists to develop your look. From classic to cutting-edge, our attentive professionals know the wedding and bridal trends. Fully customizable wedding party packages can start days in advance with spa facials, body treatments, and nail services. then progress to your wedding day hair and make-up services performed while you relax and sip a complimentary mimosas with your wedding party.